The ProFund programme aims to ensure young researchers are familiar with the procedures involved in applying for third-party funding. We at FAU are here to help, and this programme gives you the opportunity to participate in targeted professional development designed to further your research career. At present, ProFund focuses on the Faculty of Business, Economics, and Law and the Faculty of Humanities, Social Sciences, and Theology. 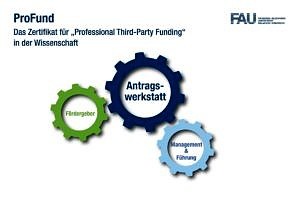 ProFund is aimed at young researchers at FAU, in particular postdoctoral researchers, habilitation candidates and junior professors. The objective is to learn how to develop ideas for new projects, apply for third-party funding, and organise and carry out third-party projects. The programme provides participants with the skills they need to create promising applications and successfully carry out third-party projects funded by the DFG, the EU, the BMBF and major foundations. You can register to take part in the individual seminars at the Graduate Centre (German) and apply for the certificate after completing the programme. Participants must attend at least three seminars to obtain the certificate. At the core of ProFund is the application workshop. We recommend you attend at least two seminars on funding providers (DFG, BMBF or EU) before taking part in the application workshop (see Module 1). If you would like to participate in the workshop, you must first submit an application of around two pages in length consisting of a project outline (problem statement, work plan, current state of research, planned funding format). It is essential that you have a realistic idea for a project in order to get the most out of the workshop. The application workshop consists of a one-day kick-off workshop, which lays the foundation for the following weeks, and a two-day closed-door conference. Course instructors will be available between these sessions if participants need individual help. Knowledge of how to organise third-party projects and of research project management is essential if you want to bring such projects to a successful conclusion. The two seminars on this topic are therefore a compulsory part of the ProFund certificate programme. Participants must also complete two further seminars offered by the Graduate Centre on topics such as knowledge communication, conflict management, supervising thesis projects and doctoral degrees, or personnel management. The optional seminars that can be selected to obtain the certificate are identified accordingly in our programme. If there is a topic that you think should be covered in a seminar which is not yet included in our programme, please let us know. We would be happy to plan seminars in the coming semester if there is sufficient interest, provided we can find suitable speakers. The seminars are mostly conducted in small groups to ensure that participants learn as much as possible. The methods used include presentations, group work, analysis of best and worst practice examples, and discussions of real examples with colleagues. Much of the content is presented using the tandem trainer principle to ensure that various different perspectives and approaches are covered. Furthermore, FAU researchers who have experience in submitting successful funding applications are invited to the seminars to share their knowledge at first hand. ProFund was set up on the initiative of the Office of Research Career Development and Graduate Centre led by Dr. Stefanie Herberger, the research representatives of the Faculty of Business, Economics, and Law (Dr. Dennis Kirchberg) and the Faculty of Humanities, Social Sciences, and Theology (Dr. Robert Fischer). The programme is supported by the Vice President People, Prof. Dr. Friedrich Paulsen. Who can participate in the ProFund programme? All postdoctoral researchers, habilitation candidates and junior professors who are members of FAU may participate. Doctoral candidates may participate if they are close to finishing their doctoral degree and there are places free in the seminars. I am a postdoctoral researcher but not at FAU. Can I participate in the seminars? No. ProFund is only open to members of FAU. I am a doctoral candidate and I am close to finishing my doctoral degree. Can I participate in ProFund? If there are places free and your application to attend the application workshop is accepted, you may participate as a doctoral candidate if you are close to finishing your doctoral degree (usually in the final year before submitting your thesis). You should register through FAU’s Graduate Centre which is responsible for the administration and organisation of the programme. Please contact Kerstin Puls. You will receive confirmation of participation for each seminar that you complete. Which seminars must I complete at minimum in order to obtain the ProFund certificate? To obtain the certificate you must complete at least three of the seminars in Module 1, the application workshop, two compulsory seminars in Module 2 (organisation of third-party projects and research project management) and two further seminars of your choice from the Graduate Centre’s programme. Is there a deadline by which I must complete the seminars in order to obtain the certificate? You do not have to complete the courses within a specific time frame. As soon as you have obtained verification that you have attended all the required courses you can request a certificate from the Graduate Centre. After you have presented confirmation of participation in all required parts of the programme, the Graduate Centre will issue you with a certificate signed by the Vice President People. If you have completed relevant courses at other institutions, they may be accredited provided they are judged equivalent. How do I apply for the application workshop? To participate in the workshop, you must first submit an application consisting of a project outline (problem statement, work plan, current state of research, planned funding format) of around two pages in length to one of the representatives. The representatives select participants for the application workshop on the basis of the project outlines. The focus is also on the likelihood of success of an application for third-party funding and not solely on the details of the research project. Which criteria are used to select participants for the application workshop? The quality of the project outline and the applicant’s qualifications are the key criteria. Which additional seminars can I take as part of module 3? The optional ProFund seminars that can be selected are identified as such in our seminar programme. These are, for example, research project management, staff management and team management, managing and motivating staff. An overview of these and other courses and seminars offered by the Graduate Centre is available here. There is an important topic that I think should be included in module 3, but there is no seminar offered on this topic. What can I do? Please contact Kerstin Puls. Our programme is based on the interests of our participants. We will be happy to evaluate your suggestions and plan a new seminar for the next semester if there is sufficient interest, provided we can find suitable speakers. I am interested in some of the seminars in the ProFund programme but I don't need the certificate. Can I still participate? Yes, if there are places free. I have already completed seminars at another university with the same content as some of the ProFund seminars. Can these be accredited? If you can demonstrate that you have completed other seminars with the same content, they may be accredited by the Graduate Centre. We will pass on information about accredited seminars to the representatives directly. The representatives select participants for the application workshop based on the potential of project outlines.